Members of this cult seek to harness the power of Olhydra, the Princess of Evil Water, and drown the world with typhoons, tidal waves, and torrential rain. They use magic to breathe water, and they meditate while bathing in pools of scented water. 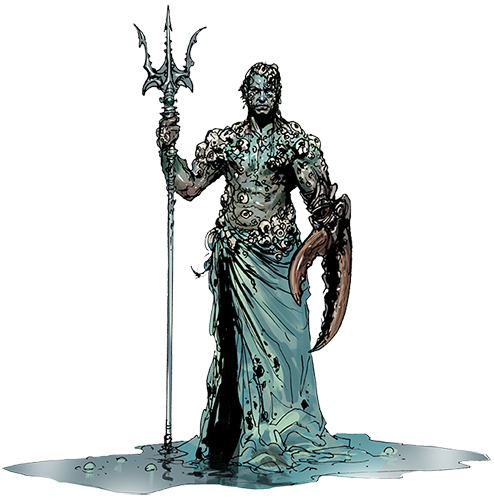 Water cultists are elusive, dauntless, opportunistic, and slippery. They surge forth to confront an enemy head-on but are wise enough to retreat when overwhelmed. Gar Shatterkeel has the magic and the morose disposition of a druid, but his affinity is toward the sea, not the land. In fact, the necessity of being away from the open sea distresses him greatly. His skin is covered with barnacles, and he wears very little clothing otherwise. His left arm is gone below the elbow, and replacing the missing appendage is an artificial limb that resembles a crab’s pincer claw. Gar was born on the Nelanther Isles, but he lost his family to sahuagin at a young age and was dragooned into serving aboard a Tethyrian merchant vessel. During a pirate attack, Gar was knocked overboard and cast adrift on some wreckage. A shark bit off his left arm at the elbow before a powerful current bore him away. Believing the current to be a water elemental sent to him by a higher power, he spent years trolling the coast, “earning the ocean’s trust,” and gathering his cult. Olhydra surges forth tirelessly and relentlessly, retreating in the face of adversity only to return stronger than before. She erodes that which she cannot batter and drown. Her natural form resembles a great wave with pearly, opalescent eyes. The Elemental Evil expansion is coming—and brings with it the paladin class and increased level cap to 70! Abolish an ancient evil threatening devastation in this adventure for the world’s greatest roleplaying game! Daniel Gelon continues the painting process of Gale Force Nine’s earth myrmidon.